Are there any Pokemon Go fans out there? If so, you might find this Magikarp hat to be strangely familiar! 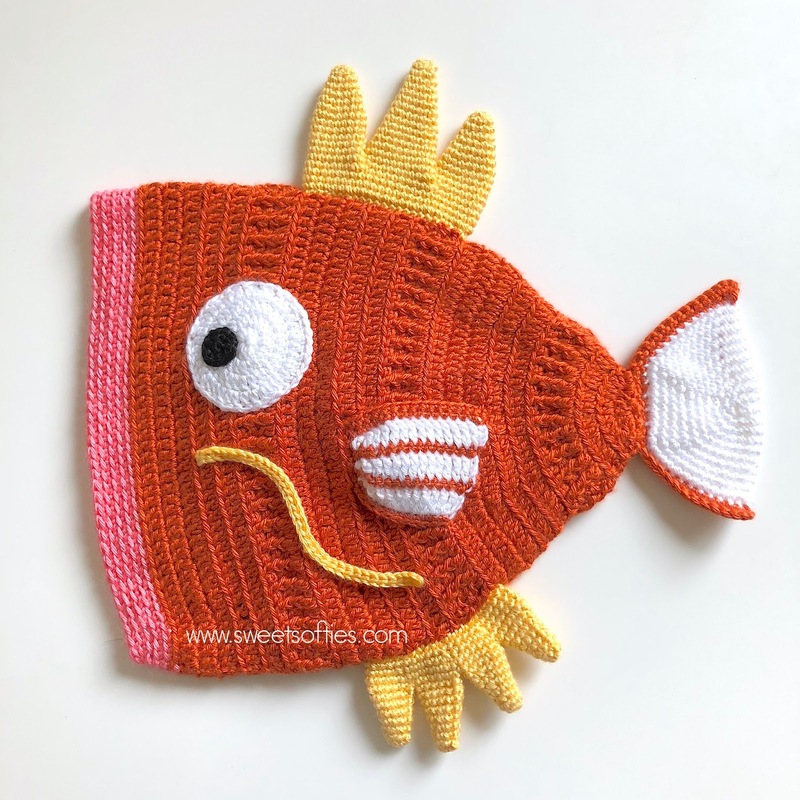 This is a rather late post, seeing as the Pokemon Go game came out well over a year and a half ago, but I finally got to finishing up my version of the Magikarp hat! My selfless husband, who never asks for a single thing from me, finally requested it after I pestered him over and over to think of something that I could make for him! 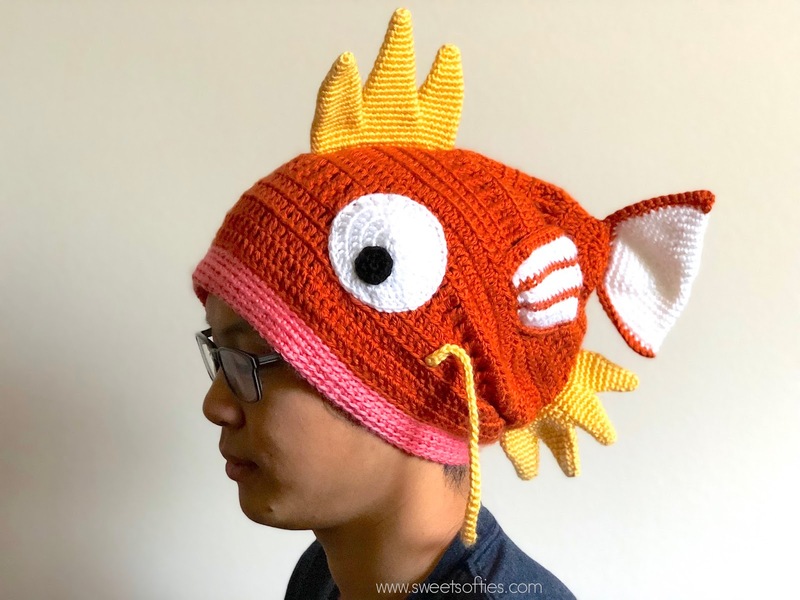 At first, I had to do a double-take after hearing that he wanted a Magikarp hat out of all the possibilities. 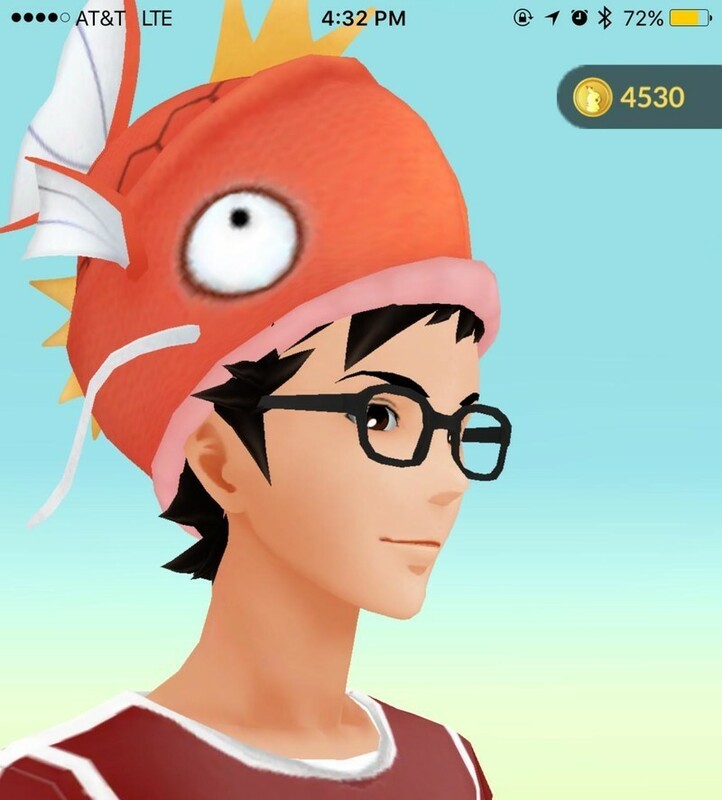 I don't know about you, but it looked a bit goofy to me - to say the least - so I questioned his seriousness... but he was pretty dead serious about wanting a Magikarp hat. Thus, I set out with the goal of constructing the best Magikarp hat I could possibly muster up! I began by making a slouchy beanie, and played around with the different stitches that are based off of Jenni Designs' Slouchy Beanie pattern! For the Magikarp's mouth, I used pink yarn to make rows of single crochets in back loops, decreasing just slightly at the joining areas. 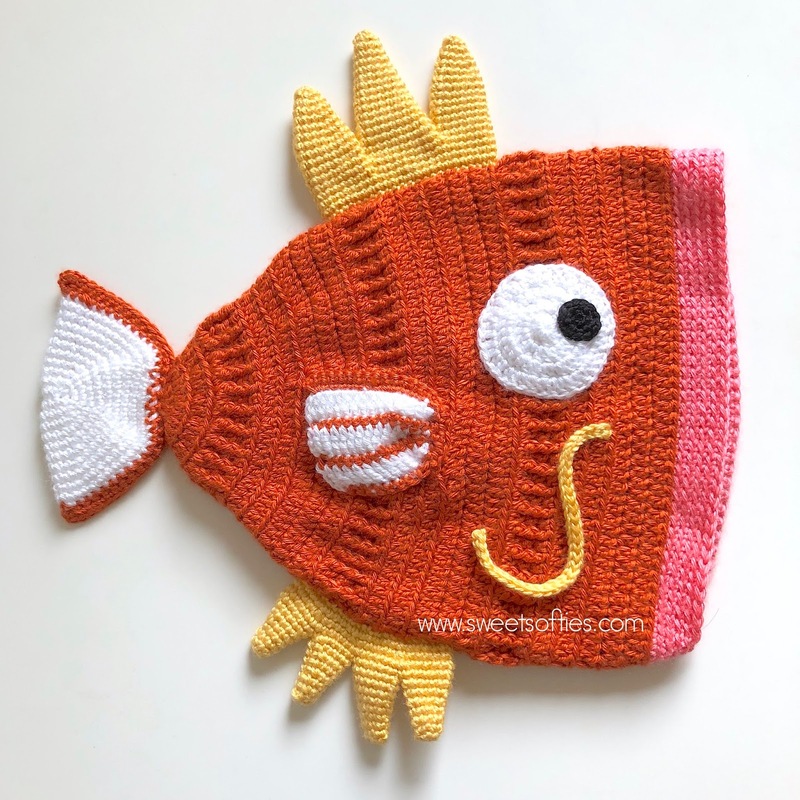 After the base of the body was done, I crocheted the individual pieces, including the Magikarp's white eyes and black pupils, yellow upper fin, yellow bottom fin, orange-and-white flippers on both sides, yellow whiskers, and orange-and-white tail. A lot of it was trial-and-error, trying to form the right shape to the right size, using the right colors! When the individual pieces were finished, I positioned them onto the Magikarp's body to check placement before sewing them to the hat. Unfortunately, I didn't keep track of or write down my stitches for this particular design... So presently, there isn't a pattern for this Magikarp hat! If there's enough interest, I can go back to re-create and re-work this design to produce a written pattern. 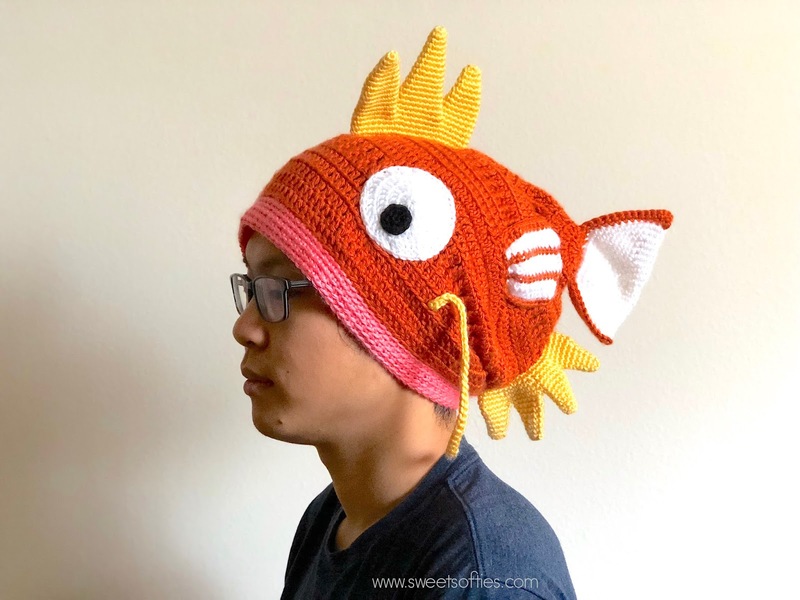 After seeing him sport the Magikarp hat so well, I wanted to try it on too! I think he wore it better, though! Drop a comment below to let me know your thoughts, if you have made any character hats yourself (pics please!! ), if you'd like to see any related projects in the future, or whatever else comes to mind! Please, please let me know this pattern! It’s gorgeous!